Sensory Overload: Isamu Noguchi ~ sculpture, spirit....stamps?! Some, but certainly not all (hell, not even most), law students question their choice of career path after graduation, and certainly they do this after taking the dreaded, soul-ripping Bar Exam. We get weighted down by our expectations, fears, and memory loss of life-before-law-school. I'm in the eye of that existential storm, turning over in my head the multitude of perceptions I have about the law, and social justice, and legal writing, and even just sheer exhaustion of arguing issues. In short, is that what I want to be "when I grow up?" And, I have another friend questioning what "label," if any, best describes him now that he is an attorney. To him I said, "ball of clay." And so, I'm content with my ball of clay right now ~~ chaotic, messy, unformed, constrained by the past and personal history, yet still malleable by the future, and so the kiln ignited by new insight. 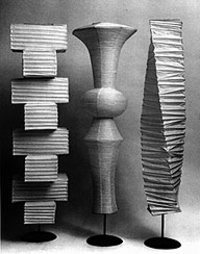 If you can, read more about Isamu Noguchi, here, and see a partial list of his works, here, and definitely check out his museum, here. you go to the post office?